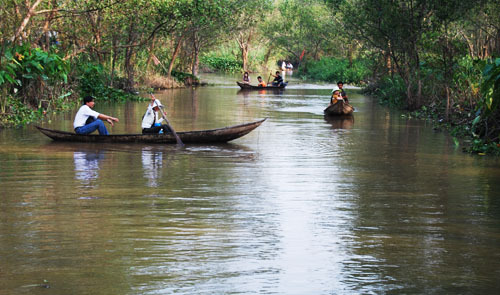 Boating is one of the 'specialties' of tourism in the Mekong Delta, Vietnam. U.S. travel magazine Travel + Leisure suggests people travel to Vietnam and Cambodia by river and spend three to 15 days trying riverboat tours in the Mekong River region – one of the best places for tourism next year. The Mekong River region ranked eleventh out of the 50 best places to travel in 2015 and was seen pulsing with new life thanks to a slew of riverboat launches, Travel + Leisure said on its website. The site recommended several river tours in which travelers can discover the wild, peaceful landscape of the Mekong River and learn about the residents’ living style while visiting Vietnam and Cambodia by boat. Two riverboat tours are now available on the 124-passenger cruise ship AmaDara and the 18-stateroom vessel Avalon Siem Reap. Both services offer a 15-night trip connecting Vietnam and Cambodia. Travelers who have less time might select a shorter Mekong riverboat trip with three-, four-, and seven-night itineraries between Ho Chi Minh City, Vietnam, and Siem Reap, Cambodia. Other locations selected by Travel + Leisure as the best places to travel in 2015 include Bali Island and Jakarta (Indonesia), Hokkaido Prefecture (Japan), Chengdu City (China), and Singapore. The Mekong River is a trans-boundary river in Southeast Asia. It is the world's 12th-longest river and the 7th-longest in Asia. From the Tibetan Plateau the river runs through Yunnan Province (China), Myanmar, Laos, Thailand, Cambodia, and Vietnam. The extreme seasonal variations in flow and the presence of rapids and waterfalls in the Mekong River have made navigation difficult. It is also one of the richest areas of biodiversity in the world and is home to many species of very large fish.